Quality Window Washing would like to offer you our window washing services and assure you that our services will meet your commercial or residential window needs. 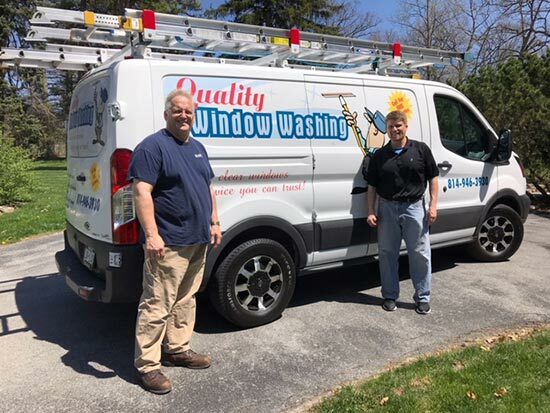 Our business is a locally and privately owned business in Altoona, PA. For over 11 years, we have provided the Central Pennsylvania area with high-quality window washing as well as power/pressure washing, light fixture cleaning and screen cleaning. With our company there are no large crews or expensive equipment to drive up costs, just a family owned business that will offer competitive prices that you can afford. At Quality Window Washing, we strive to maintain our credible services in window washing industry and look forward to meeting your needs. All cleaners we use are mild, non-corrosive, environmentally friendly and safe for families and pets. For more information and a free estimate for our services, contact Quality Window Washing at (814) 946-3930 for Altoona and (814) 932-8457 in State College. we can offer our window cleaning services at affordable prices that fit your budget, while also being competitive. With power/pressure washing from Quality Window Washing all of that can be quickly and efficiently removed from any home. Light fixtures can affect the tone and appearance of any home or commercial building. Cleaning the screens of your windows keeps them looking nicer and last longer. Window cleaning is a lot more important to a business than most professionals realize. There are many benefits to hiring professional window cleaners to ensure that your business shines on the inside and out. Not only will people see your business as inviting, but will look much more appealing from the street. Having clean windows attracts more customers towards your business than windows covered in smudges, streaks and dirt. It might not seems like a big deal, but having a clean environment to come to work to can give you pride in your work, and make it more enjoyable. If your windows are dirty, they seem to bare less value. This does not necessarily pertain to the window itself, but your windows can give a first impression of the quality of your business. Clean windows can increase resale value, heighten business opportunities and increase renting possibilities. When your windows are clean, it allows more natural light to stream into your workspace. When working in an office all day, having any semblance of the outside world can feel like a blessing. Clean windows give you the opportunity to enjoy the natural light to the best of your ability. Clean windows are inviting. They allow people to see into your business and encourage customers to come in. If the outside of your business is clean and inviting, customers know that the inside is clean as well. Professional commercial window cleaning services are a must for any professional business. 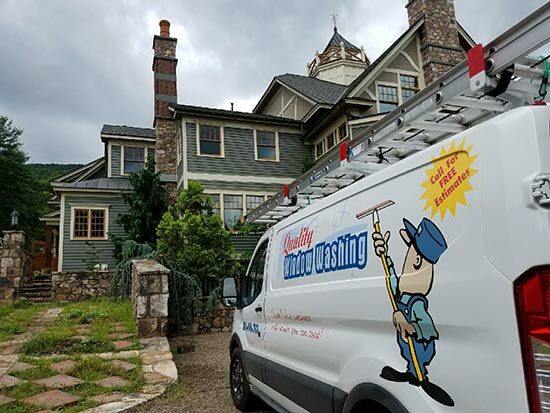 If you really want to show your community that your business is a cut above the rest, hiring a commercial window cleaning service will allow you to do just that. You will get the best results every time and have a business, office or storefront that you can be proud of every day. Over time glass will deteriorate because of contaminants. Glass is a porous material and can become obstructed with airborne pollutants, or deposits from rain runoff from wood stain, paint or concrete sidings. Other contaminants to glass include hard minerals from sprinkler systems, building run-off, oxidation from windows encased in metal frames and screens, acid rain, traffic spray, over spray from paint and caulking mortar. Windows at your home or commercial building should be cleaned at least twice a year to remove contaminants and ensure longer lasting clarity in your windows. ©2019 Quality Window Washing All Rights Reserved.